Labels in German. "Zellen" = "cell","riech" = "smell", "Riechnerv" = olfactory nerve, "cillien" = cilia. An olfactory receptor neuron (ORN), also called an olfactory sensory neuron (OSN), is a transduction cell within the olfactory system. Humans have about 10 million olfactory receptor neurons. In vertebrates, ORNs are bipolar neurons with dendrites facing the inferior space of the nasal cavity and an axon that passes through the cribriform plate then travels along the olfactory nerve to the olfactory bulb. The ORNs are located in the olfactory epithelium in the nasal cavity. The cell bodies of the ORNs are distributed among all three of the stratified layers of the olfactory epithelium. Many tiny hair-like cilia protrude from the olfactory receptor cell's dendrite into the mucus covering the surface of the olfactory epithelium. The surface of these cilia is covered with olfactory receptors, a type of G protein-coupled receptor. Each olfactory receptor cell expresses only one type of olfactory receptor (OR), but many separate olfactory receptor cells express ORs which bind the same set of odors. The axons of olfactory receptor cells which express the same OR converge to form glomeruli in the olfactory bulb. ORs, which are located on the membranes of the cilia have been classified as a complex type of ligand-gated metabotropic channels. There are approximately 1000 different genes that code for the ORs, making them the largest gene family. An odorant will dissolve into the mucus of the olfactory epithelium and then bind to an OR. ORs can bind to a variety of odor molecules, with varying affinities. The difference in affinities causes differences in activation patterns resulting in unique odorant profiles. The activated OR in turn activates the intracellular G-protein, GOLF (GNAL), adenylate cyclase and production of cyclic AMP (cAMP) opens ion channels in the cell membrane, resulting in an influx of sodium and calcium ions into the cell, and an efflux of chloride ions. This influx of positive ions and efflux of negative ions causes the neuron to depolarize, generating an action potential. The olfactory receptor neuron has a fast working negative feedback response upon depolarization. When the neuron is depolarizing, the CNG ion channel is open allowing Sodium and Calcium to rush into the cell. The influx of calcium begins a cascade of events within the cell. Calcium first binds to calmodulin to form CaM. CaM will then bind to the CNG channel and close it, stopping the sodium and calcium influx. CaMKII will be activated by the presence of CaM, which will phosphorylate ACIII and reduce cAMP production. CaMKII will also activate phosphodiesterase, which will then hydrolyze cAMP. 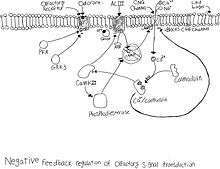 The effect of this negative feedback response inhibits the neuron from further activation when another odor molecule is introduced. A widely publicized study suggested that humans can detect more than one trillion different odors. This finding has however been disputed. Critics argued that the methodology used for the estimation was fundamentally flawed, showing that applying the same argument for better-understood sensory modalities, such as vision or audition, leads to wrong conclusions. Other researchers have also showed that the result is extremely sensitive to the precise details of the calculation, with small variations changing the result over dozens of orders of magnitude, possibly going as low as a few thousand. The authors of the original study have argued that their estimate holds as long as it is assumed that odor space is sufficiently high-dimensional. ↑ Berkowicz, D. A.; Trombley, P. Q.; Shepherd, G. M. (1994). "Evidence for glutamate as the olfactory receptor cell neurotransmitter". Journal of Neurophysiology. 71 (6): 2557–61. PMID 7931535. ↑ Vermeulen, A; Rospars, J. P. (1998). "Dendritic integration in olfactory sensory neurons: A steady-state analysis of how the neuron structure and neuron environment influence the coding of odor intensity". Journal of computational neuroscience. 5 (3): 243–66. PMID 9663551. ↑ Schacter, Daniel L. (2014). Psychology. p. 167. ISBN 1464106037. ↑ Cunningham, A.M.; Manis, P.B. ; Reed, R.R. ; Ronnett, G.V. (1999). "Olfactory receptor neurons exist as distinct subclasses of immature and mature cells in primary culture". Neuroscience. 93 (4): 1301–12. doi:10.1016/s0306-4522(99)00193-1. PMID 10501454. ↑ McEwen, D. P (2008). 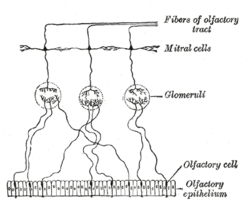 "Olfactory cilia: our direct neuronal connection to the external world.". Curr. Top. Dev. Biol. 85: 333–370. doi:10.1016/S0070-2153(08)00812-0. ↑ Touhara, Kazushige (2009). "Insect Olfactory Receptor Complex Functions as a Ligand-gated Ionotropic Channel". Annals of the New York Academy of Sciences. 1170: 177–80. Bibcode:2009NYASA1170..177T. doi:10.1111/j.1749-6632.2009.03935.x. PMID 19686133. ↑ Bieri, S.; Monastyrskaia, K; Schilling, B (2004). "Olfactory Receptor Neuron Profiling using Sandalwood Odorants". Chemical Senses. 29 (6): 483–7. doi:10.1093/chemse/bjh050. PMID 15269120. ↑ Fan, Jinhong; Ngai, John (2001). "Onset of Odorant Receptor Gene Expression during Olfactory Sensory Neuron Regeneration". Developmental Biology. 229 (1): 119–27. doi:10.1006/dbio.2000.9972. PMID 11133158. ↑ Bradley, J; Reuter, D; Frings, S (2001). "Facilitation of calmodulinmediated odor adaptation by cAMP-gated channel subunits". Science. 294: 2176–2178. doi:10.1126/science.1063415. ↑ Wei, J; Zhao, AZ; Chan, GC; Baker, LP; Impey, S; Beavo, JA; Storm, DR (1998). "Phosphorylation and inhibition of olfactory adenylyl cyclase by CaM kinase II in Neurons: a mechanism for attenuation of olfactory signals". Neuron. 21: 495–504. doi:10.1016/s0896-6273(00)80561-9. ↑ Yan, C; Zhao, AZ; Bentley, JK; Loughney, K; Ferguson, K; Beavo, JA (1995). "Molecular cloning and characterization of a calmodulin-dependent phosphodiesterase enriched in olfactory sensory neurons". Proc Natl Acad Sci USA. 92: 9677–9681. doi:10.1073/pnas.92.21.9677. ↑ Bushdid, C.; Magnasco, M. O.; Vosshall, L. B.; Keller, A. (2014). "Humans Can Discriminate More than 1 Trillion Olfactory Stimuli". Science. 343 (6177): 1370–2. Bibcode:2014Sci...343.1370B. doi:10.1126/science.1249168. PMID 24653035. ↑ Meister, Markus. "On the dimensionality of odor space". eLife. 4. doi:10.7554/eLife.07865. ↑ Gerkin, Richard C.; Castro, Jason B. "The number of olfactory stimuli that humans can discriminate is still unknown". eLife. 4. doi:10.7554/eLife.08127. Wikimedia Commons has media related to Olfactory receptor neurons.